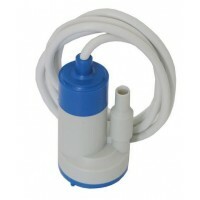 Recommended for aquariums up to 1,000 litres (264 USgal.) of salt water. Air capacity: 600 l/h (158 USgal./h), skimmer cup volume: .7 l (.18 USgal.). 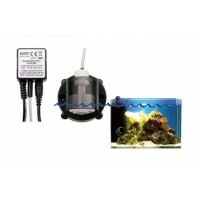 Skimming, filtering and aerating a saltwater aquarium without power consumption is impossible. 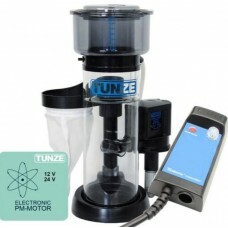 But, no unit uses less current than TUNZE® DOC Skimmer 9410. At a power consumption of only 12 watts to 29 watts, the new DOC Skimmer has equivalent performance to much larger skimmers consuming more than five times as much power. In addition, no settings are required; it is extremely silent; it is easy to operate and it is nice to look at. The removable post-filter at the outlet of the skimmer permits perfect mechanical filtration through 50 µm acrylic wadding fibres with little biological action. This ensures that no unwanted nutrient and nitrate sources develop in case of longer cleaning intervals. 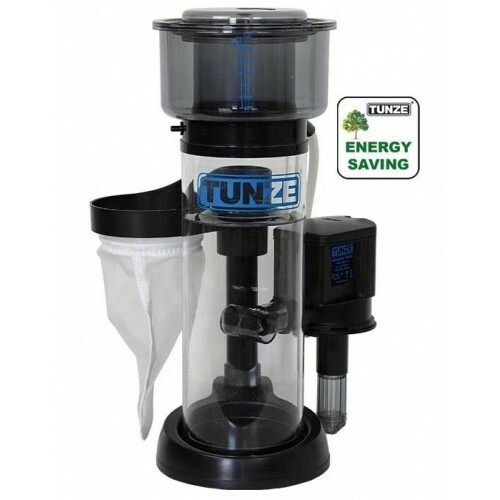 The filter can be filled with other filter media, such as activated carbon or phosphate absorber. TUNZE® Hydrofoamer Silence 9410.04 is a pump specifically developed for protein skimmers. The Hydrofoamer generates large volumes of fine air bubbles with a diameter of between 0.1 to 0.3 mm (.0039 to .011 in.). It has an energy consumption of only 12 W (16 W) at an air output of 600 l/h (158 USgal./h) which places this air generator at the top of its product class. At a water flow of 900 l/h (1,000 l/h) (237 USgal./h / 264 USgal./h), it is also used to supply the aquarium water to the skimmer.